A top Republican in the state Senate says members of the Wisconsin Elections Commission should pick a new administrator, or else lawmakers will pick one for them. Members of the Elections Commission have argued that Haas can only be fired by the panel. Even though the Senate has denied his confirmation, commissioners contend he can keep the job until they vote to fire him. The dispute is expected to result in a legal battle. 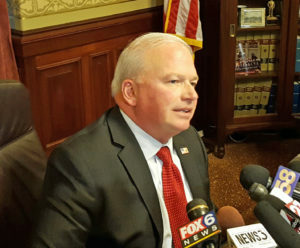 Fitzgerald also praised the Wisconsin Ethics Commission, which voted Thursday to leave its administrator position open for the next 45 days after the Senate also rejected the confirmation of interim director Brian Bell.